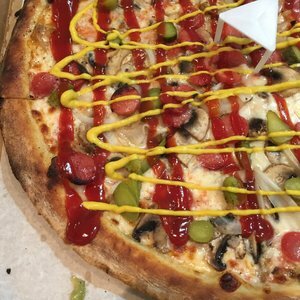 The “Who Let the Dogs Out” hot dog pizza at Katani; Yelp photo by Dan B. 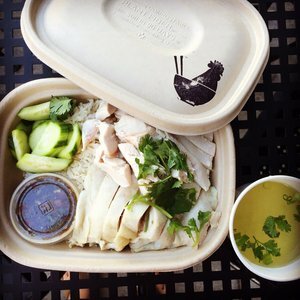 Fans of the tasty khao man gai (Thai-style chicken and chicken rice) at ~ROOSTER &AMP; RICE~ in the Marina will now have a second location to visit in SoMa, according to Hoodline. You can get the original version (poached breast and thigh meat with jasmine white rice), or get skinless breast with organic brown rice, or a vegetarian version with organic tofu. Simple and kind of perfect. Hours to start are Mon-Fri 11am-3pm. 303 2nd St. at Howard. For my fellow Panhandle residents, Hoodline also reports we now have pupusas in the neighborhood, along with sandwiches, espresso drinks, and more at ~MANITAS CAFE~, a new Salvadoran restaurant. 2078 Hayes St. at Cole. Nearby, actually on the same block, ~KATANI PIZZA~ is also open in the former Panhandle Pizza. Look for thin-crust pizzas on the menu (yup, they have some creative ones), pastas, and they are even making their own version of jalapeño poppers. Open daily 11am-11pm. 2077 Hayes St. at Cole, 415-742-5234. Over in West Portal, ~LEMONADE~, the fast-casual vegetable-focused chain (but there are still meats, like Thai chicken meatballs in green curry sauce) from LA is opening another SF location on Thursday December 8th. Open daily 11am-9:05pm. 16 West Portal Ave. at Ulloa.